Wild harvest from our mountain! Year round, our mountain provides wild delicacies that have been harvested since the settler’s times and long before. 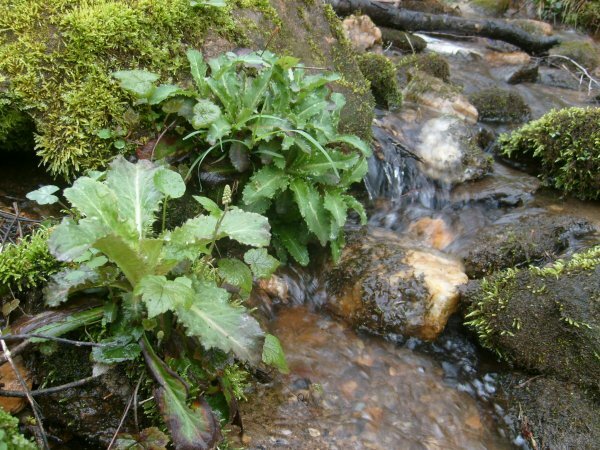 In the Spring we enjoy the first greens with Creasy–Upland Cress—and the Branch Lettuce that grows along the creeks, and we hunt for the first wild mushrooms. Then come Branch Mint with its lovely chocolatey overtones, Lamb’s Quarter, Chickweed Salad, tiny wild strawberries, black raspberries, and early dandelions. In summer we’re picking gallons of blackberries and harvesting chicory, nettles, wild mushrooms, mountain mint, and Sarvis berries. We might make some gumbo file or sarsaparilla from sassafras roots, or dig some Jerusalem artichoke. Come Fall we’re gathering wild grapes, and as the weather cools we’re picking up bushels of black walnuts to shell. And on a cold winter night, it’s mighty tasty to cook up a pot roast studded with allspice-flavored spicebush twigs. Whatever the season, watch our menu for these wild treats. We’ll be sharing them with you. ← Wild mushrooms from our mountain!